On June 8, approximately 75 McGill staff members joined Principal Heather Munroe-Blum for an open air yoga class under the trees of lower campus in the vicinity of the Three Bares fountain. No prerequisites were necessary, just an appreciation of the outdoors, comfortable clothing and the willingness to work out a few kinks. After everyone had claimed their spot and had settled in, Jill Barker, Manager, Communications, Athletics & Recreation (and Montreal Gazette fitness columnist) introduced instructors, Karen Hellauer and Tim Ruddy, who led novice and experienced alike through various yoga breathing techniques and poses. 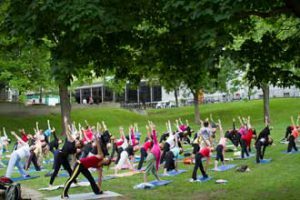 The event was a perfect way to for colleagues from across campus, whether new to the yoga experience or seasoned veterans, to get together and participate in a healthy activity in a safe and friendly environment. Everyone was enthusiastic and upbeat, creating lots of positive energy. Following the session, the Principal spoke to the participants, extolling the benefits of healthy active living. She encouraged everyone to continue to get out and be active in whatever way they can. This lunchtime session was the second in a series of quarterly events hosted by the Principal aimed at promoting the benefits of healthy activity, and organized as part of the University’s Health and Well-Being Program for Faculty and Staff. Establishing a culture of health and well-being at the University by creating awareness of the benefits of healthy living is one of the primary objectives of the Program. Since the launch of the Program in January, the popular ‘Feel Good Fridays’ lunchtime sessions have provided a wealth of information on health related topics like nutrition, how small important lifestyle changes can have a positive impact on your health, and playing safe and injury free. These sessions will continue again in the Fall.